Winco SCT-10 Stainless Steel Server / Creamer with Cover 10 oz. 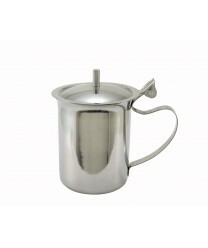 The classic look and functionality of the Winco SCT-10 Stainless Steel Server / Creamer with Cover 10 oz. will make it the perfect addition to your beverage serviceware collection. This 10-ounce server features a thumb-operated hinged top that holds in freshness and helps preserve heat or cold. With its highly polished mirror finish, this durable server will enhance any buffet spread, beverage station or restaurant table.